Another phishing email targeting bank users hit our email filters this morning. This time ANZ bank customers are being targeted. The email tells the user to “please review your account”. The email is using the guise of a so-called recently launched security system to fool people into clicking on a link to a malicious site. This particular email campaign is considerably lower in volume, and more sporadic than previous email campaigns. By this we mean that the emails have hit the email filters at random times overnight, rather than in one big timeslot. One of the emails is shown in Figure A. There is a fairly realistic ANZ bank logo used in the email. 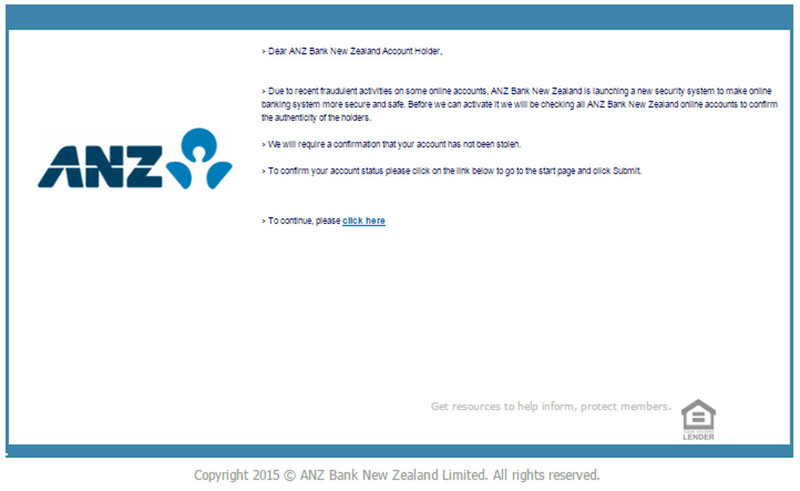 The greeting used is “Dear ANZ Bank New Zealand Account Holder”. The layout of the email is in a point type form; it almost looks like the email is a cut and paste from a PowerPoint slide. There is a solitary link in the email, with the anchor text “click here”. A copyright notice is fixed to the foot of the email. The subject of the email is “Please review your account”, whilst the sender is displayed as “ÁNZ Internet Banking”. As the email states, a new security system is supposedly being launched by ANZ. This system is in response to fraudulent activities on online accounts. The recipient is urged to click on the link in order to confirm that their account “has not been stolen”. The URL in the link contains the string “anz”, in an attempt to add some extra authenticity. This email is a fake, of course. The ANZ bank will address the customer using the name the account is held in. They do not use the sort of generic greeting used in this email. Mousing over the link also shows it to be fake. As we mentioned, the string in the URL does contain ANZ, but the actual domain name is not an ANZ domain name. The site linked to is a malicious site that attempts to steal user details. This email is a fake and can be deleted.